Do you look back and remember your middle school years fondly? Are you nostalgic for silly bands and rainbow goldfish? Do you dream of spending a Friday night reliving the cringiest moments of your prepubescent life? What if all of it was for CHARITY? Well, here's your chance. 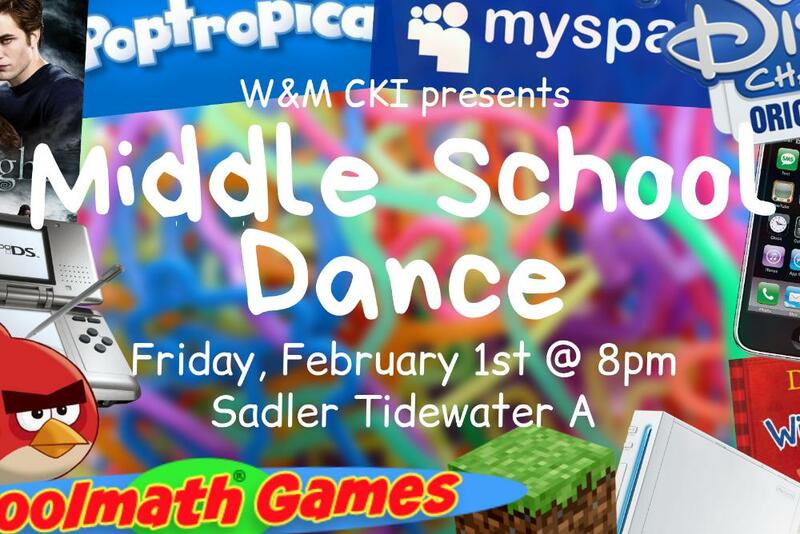 William & Mary Circle K International invites you to join us for a college-aged Middle School Dance to raise money for a Builder's club at Berkeley Middle School. All proceeds will go towards chartering the club, which will allow children the opportunity to participate in community service projects after school, in addition to providing mentorship opportunities for local high schoolers. Join us on Friday, February 1st 8:00 PM - 10:00 PM in Sadler Tidewater A! Tickets available for $3 before the event or $5 at the door. Venmo us @WM-CKI or look for our table in Sadler Jan 28-Feb 1. Free silly band with purchase! All music is from 2008-2013. Decorations reminiscent of a hastily-converted public school cafeteria. Snacks and refreshments will take you back to the simpler days when mom packed your lunch. Come as you are, or, if you're brave, come as you were in middle school. Brightly colored eye shadow, sweatshirts around your waist, and Justin Bieber hair welcomed.